Russian Tea made several bloggers’ Best Perfumes of 2014 lists and having a fondness for tea fragrances myself, I was keen to check it out. Masque Milano was started by two young Italians, Riccardo Tedeschi and Alessandro Brun. The collection represents “the opera of their lives” with each scent having an Act and a Scene number. They launched their first fragrance in 2013 and Russian Tea (Act 1, Scene III) is their fifth. It includes notes of mint, black pepper, raspberry, black tea, magnolia, everlasting flower, leather accord, incense, birchwood and cistus labdanum. Russian Tea sets out to tell a story from the 18th Century about camel caravans transporting tea from the East to Europe via Russia. It was said that the cold, dry climate of Siberia imparted a delicacy of flavour to the tea, which was unloaded onto the snow-covered steppes each night. It was also believed that the leaves were infused with smokiness from the campfires. Perfumer Julien Rasquinet also sought to encompass the warmth and comfort of the Russian tea ritual. The leaves were brewed in a pot and a little of this concentrate was poured into cups. 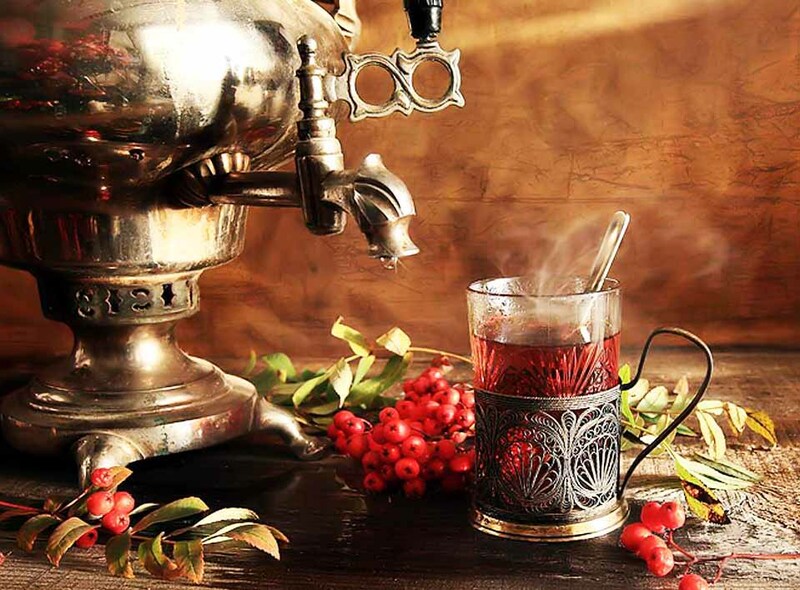 Hot water was then added from a samovar (a traditional metal urn) with sweetness coming from sugar, honey or raspberry jam. However, these tales are likely to be largely the result of romanticism. In her post In the Search for the Perfect Berry: Raspberry, Undina tells us she has no knowledge of these fables about “Russian tea” despite growing up in that part of the world. Backstory aside though, what is the fragrance actually like? Well, for a start, it is actually leather rather than black tea which constitutes the body of the fragrance. I was apprehensive about the mint and I can’t say I found it an enjoyable experience, although it didn’t last long. The opening stage is bracing spearmint over smoky birch tar. Russian Tea settles into a gently spiced, soft smoulder with enough sweetness to counteract any bitterness. I find it comfortable to wear however it’s less cosy than Tea for Two. It has that seat-by-the-fireside warmth but it is also evocative of a cold starless night in the hinterlands. It’s quieter and lacks the strong cinnamon overlay of the L’Artisan. The labdanum comes through in the base and works well with the smoky leather. I was really looking forward to the raspberry note but sadly I fail to pick it up. I find the lasting power is excellent while it has a fairly moderate level of projection. I would say it leans towards masculine, particularly in the beginning. 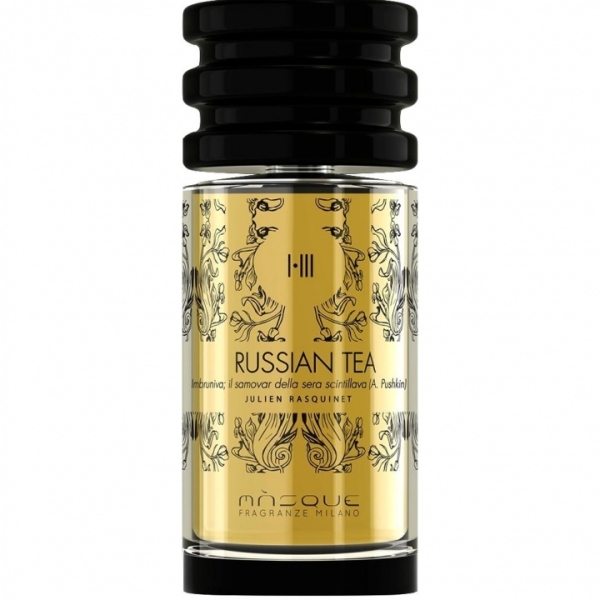 Russian Tea possesses a mysterious mood and is distinctive without being loud or showy. I would have preferred to get raspberry infused tea but it is sophisticated in its mellow, enigmatic way. Have you tried this or any of the other Masque Milano fragrances? This entry was posted in By Tara, Fragrance Reviews and tagged Fragrance, Masque Milano, Perfume, Review. Bookmark the permalink. Oh dear, Ana Maria, that’s not good. I’m wearing it again today and I do get the sweet spices, although that does reduce over time as I recall. It’s very far from voluptuous that’s for sure. Hopefully I will have better luck with the rest of the line. I won’t repeat my opinion about this perfume (thank you for the link! 🙂 ) but I want to say that the second perfume from Masque Milano that I tried – Tango – I liked more. Definitely not enough to even think of those 100 ml bottles but definitely better on my skin. Thanks for the heads-up about Tango, Undina. I will try that one next as I have a set of samples. It has to be beyond great to invest in 100ml. Thanks Tara for reviewing this one – there has been a lot of hype over this brand and I have been curious about trying these but am a bit apprehensive now. The mint though sounds more intriguing than off putting. You know, Sandra, this may work well for you. Especially as you don’t mind the sound of the mint and you are a leather fan. The mention of (even fleeting!) mint and birch tar would have me taking steppes in the opposite direction, hehe, and Ana Maria’s reference to acrid smokiness confirms how I was afraid this might smell. Masculine leaning frags seem even more so on my skin. So probably not my ‘cup of tea’, even were the tea more prominent. Enjoyed the review though – and the backstory! I might also seek out my sample of Gunpowder Rose, to see what that is like. The mint is rather toothpaste-tastic I must say. I don’t find it acrid, but I’m pretty sure it would be too masculine-leaning for you. You know, I really fell for the backstory so was quite deflated when Undina said it was unheard of! Ines, if this is likely to work on anyone it will be you. I think you’d carry it off well. The mint is not for me and does jar, but I read the Masque Milano guys had fresh mint leaves in their tea in Russia so that must be where it comes from. The mint sounds a bit off-putting. The bottle is lovely, though, even if it looks like it should be in the ‘Food Hall – World Teas’ department rather than ‘Fragrances’! Annette, the mint is off-putting but it doesn’t last long if you like the sound of the rest of it. It’s nice to see a different style of bottle but it really does look like a tea cannister, it’s true! I need to try this one again as when I tried the range my favourite was instantly Tango and I thought the others paled a bit in comparison. I remember that Montecristo was quite good too – a bit of a dirty tobacco perfume. I am just starting to get into tea perfumes though so good for a retry. Thanks for sharing two of the Masque fragrances you got on with, Megan. I’ll definitely try Tango and Montecristo next. I didn’t get much tea from this one, but always worth a re-try. Hey Tara, thanks for the review! I really enjoy Russian Tea, I like that opening mint, the coolness, smokeyness, great tea note… The sample I had was only a half so it got used up pretty quickly – I’ve got another on order to give it another run through to see whether it is FB worthy for me. 🙂 I don’t remember getting any raspberry… That would be nice. Tina, it’s great to hear from someone who really likes this! I hope you like it just as much when your new sample arrives. Not that many people seem to get the raspberry, which is a shame. Tara, I have tried this and didn’t like it at all. It’s dry-down left me smelling like a cigarette ashtray. Not the way I want to smell at all! Since this was my first try with a perfume from this house, it’s made me a little leary of any others. I did like the back story though. That and the fact I’m trying to find a tea scent I like are what made me try it in the first place. Oh that’s too bad, Kandice. I hope you find a tea fragrance that works for you. I think my experience of Russia Tea has actually been quite a bit better than most people’s. It’s not acrid or ashy on me. A couple of commenters above have recommnended others in the line so I’m not going to give up yet, but I know how off-putting it can be when you have a negative first experience with a new line. I really liked the backstory too. When I’ve looked at their perfumes I have been a bit put off by certain notes or combinations, but then, one can never know what a fragrance smells like from the notes, and I’m always begging for perfumers to come up with new things/ combos rather than same old, same old. So I will give them a try at some point. Well if there’s any you do think you’d like to try out, let me know and I’ll send you what remains of my samples when I’ve gone through them, as I have a set. After the opening mint and birch tar, I found it perfectly enjoyable. I think I would have loved it if there was more tea and raspberry but the gourmand spices over the quietly smoky leather was just fine. I do wonder how you’d like it. Definitely less cuddly than Tea for Two. I do remember LJG! I can imagine it suiting you beautifully. I wore it today in 23 degrees and it was fine but, of course, it is such a cold weather fragrance. Winter in Moscow would be the perfect time and place to wear it. Yes, good idea. I’ve found it fine in a bit of warmth but there’s no doubt it’s a fragrance for chilly days and long, dark nights. The mint is an issue for me but you never know, you might like the rest of the development so much you don’t mind. Worth a try. I’m looking forward to trying more from the line. I have worn out my sample of Luci ed Ombre by the Masque crew. It was beautiful and I really enjoyed it. Were I not already overloaded with amber fragrances it definitely would have been a FB. I think I also had quite good luck with Tango but can’t remember anything about it. I love mint in fragrance and have never shied from a whallop of birtch so maybe I’ll have a go of this one too. Thanks for the tip about another Masque fragrance, Portia. It’s good to have pointers as to where to go from here. I bet the mint/birch combo wouldn’t bother you a bit. I dare say you might enjoy it.